Social media is a great way for customers to reach out and contact Everything Dinosaur. We have a fairly active profile on Facebook, Pinterest and other social media platforms such as Twitter and Youtube. Our team members do try to respond to all the questions, queries and enquires we get. There are lots and lots each day, too many for us to count. 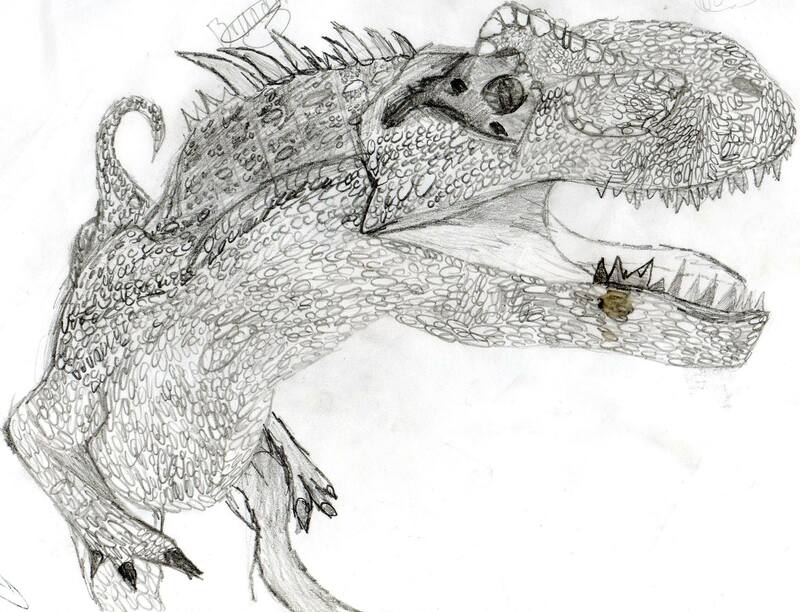 However, when Clare Hart, contacted us a few weeks ago to tell us all about her son and his fascination for dinosaurs we made a promise, if her son sent in a drawing of a dinosaur to us, we would post it up for him. Sure enough, Clare has provided Everything Dinosaur with a lovely drawing of a meat-eating dinosaur created by her son Brandon. An interesting perspective and great care has been taken over the drawing. The illustration above shows an unusual view of a meat-eating dinosaur. The picture gives the impression that the drawing has been made by looking from the side of the head back down the Theropod’s body. Great care has been taken to show the different type of skin patterns that have been seen in fossil Theropods. The large fenestra (opening) in front of the eye socket has been depicted and from the overall appearance and those crests over the orbit (eye socket), we would suggest that this drawing represents a member of the Superfamily Allosauroidea. There are a lot of dinosaurs within this particularly Superfamily, but this could be a drawing of an Allosaurus (Allosaurus fragilis), nicknamed by many palaeontologists as the “lion of the Jurassic”. A Papo Allosaurus dinosaur model. Allosaurus was a formidable predator, amongst the largest known from rocks that date from the Upper Jurassic. Brandon’s dinosaur has a row of dermal spines running down the animal’s “s-shaped” neck, this type of ornamentation is seen in a number of illustrations of this meat-eating dinosaur. Ironically, in this digital age when a mobile phone can incorporate a camera capable of taking exquisitely detailed photographs, scientific illustration remains very important. Tutors used to tell us that the best way to get to know a fossil is to draw it. Pencil sketches can help to reveal details and minute features not immediately obvious. Recently, Everything Dinosaur team members have been looking at drawings from the 19th Century that illustrate fossil finds from southern England. It seems that with Brandon’s carefully drawn dinosaur, the future of scientific illustration is in safe hands. We made a promise that if Clare sent us a drawing done by her son we would post it up. We like to keep our promises.